A Belmont op shop that began in the back gardens of Uniting AgeWell Kalkee Community has gone on to become a major contributor to the Victorian aged care facility and play a crucial role in the local community. Kalkee Op Shop volunteers Jann Brearley, Hazel Breguet and Marion Parfett. This National Op Shop Week, held from 21 – 27 August, the Kalkee Op Shop will celebrate 16 years of business and its significant contribution to community and renovation projects at the Kalkee Community. “The op shop is an essential part of the Uniting AgeWell Kalkee Community,” says Uniting AgeWell Kalkee Volunteer Coordinator Heather Burger. 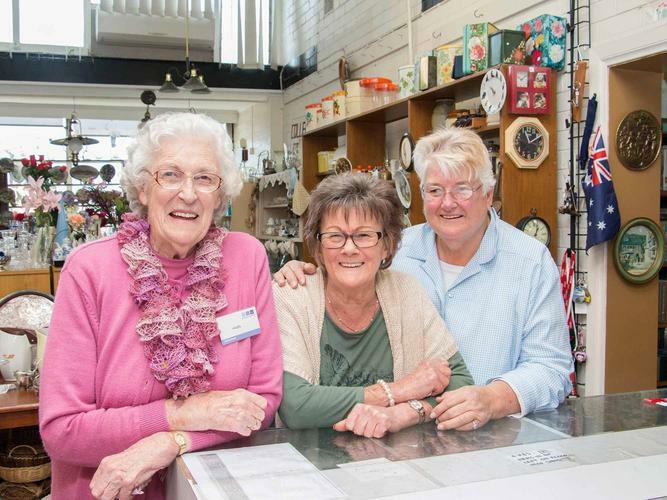 Staffed entirely by volunteers, the Kalkee Op Shop has a family atmosphere with long term volunteers, some racking up more hours each week than your average office job. Geelong woman Jann Brearley has volunteered five-and-a-half days a week for the last nine years and oversees the day-to-day operations of the shop. “We welcome volunteers from all walks of life, from professionals, seniors and jobseekers to those undertaking community service,” she says. According to Ms Brearley the Kalkee Op Shop is also a place for people in the community to come in and have a chat. “For many who come in, we are the only people they talk to the entire day, so we try to provide them with a bit of companionship,” she says. The Kalkee Op Shop is located at 50 Francis Street Belmont with all funds going towards supporting Uniting AgeWell Kalkee Community projects. Perhaps you misspelled your search query, or need to try using broader search terms.